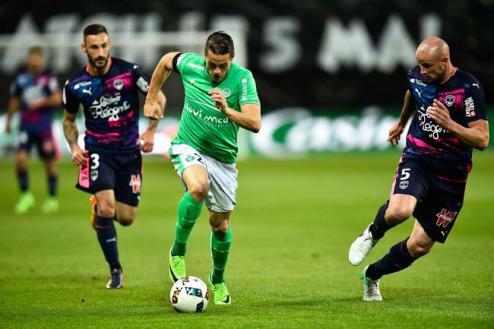 Saint-Etienne – Angers predictions for France Ligue 1 match at Stade Geoffroy-Guichard, Saint-Etienne. The Saints are strong enough at home to take all three points. Read on for live streaming info and our free predictions. Do you want to watch live streaming of Saint-Etienne – Angers and bet live? Go to bet365 Live Streaming and place winning bets! Saint-Etienne have successfully started this season and look very ambitious now. The team was worthy of high places last season, but lost a lot of energy into a two-front fight, because about half a year the Greens were distracted to the matches in Europa League. This year, the hosts can fully concentrate on the national championship. The Saints look perfect on their defensive as usual, having conceded only from one rival so far, but we can hardly accuse them, because it was PSG who scored, and their forwards cannot be stopped by anyone. Saint-Etienne defeated Nice in the first round, and then Caen on the road, both games ended with a score of 1-0, but still these victories were confident. In the third game of the season, the Saints beat Amiens 3-0, showing this time that they can play aggressive football. Angers do not know the bitterness of the defeats yet, and their results look impressive, however, do not overestimate the guests, because they managed to beat only Amiens, who occupied the bottom of the standings from the first rounds. Yes, Bordeaux and Marseille are big names, but almost any team in League 1 can get a draw with these opponents at the moment, one point with the Danes should not be taken into account as Lille look terrible at the beginning of the season. Anyway, the Scythians made everybody respect them in August, but still they are lower class then their today’s opponent. It is also worth noting that Angers have never beaten the Saints in their history, so they will not win today and it is hard to believe in another draw. Saint-Etienne will win this game confidently.